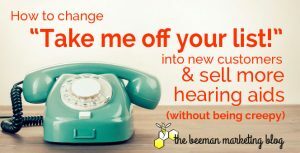 At Beeman, we offer call tracking and call coaching at no extra cost for every hearing care direct mail customer. We employ in-house call analysts to listen to and score umpteen calls every week. the “Take Me Off Your List” call. Is it possible to turn this type of call into a sale? Now yes… there are the occasional, unavoidable and inexplicable angry “Take Me Off Your List” calls. “What is wrong with YOU PEOPLE!? How could you send me this? Why do you think I can’t hear? Occasionally these also contain an expletive… or two. Who knows what happened to this person today to make them so angry. Maybe it’s even a mental illness. Take down the caller’s information (make sure to get the exact name and address on the envelope… if you can get that far with Mr. or Mrs. Irrational) then keep it in your spreadsheet of Do-Not-Mail addresses – to prevent this angry call again. Be sure you submit this list to any marketing company you use for direct marketing so that you are not continuously enraging this person. There are also the GOOD “Take Me Off Your List” calls…. This is your opportunity to make your marketing dollars work overtime. Oftentimes, the front office staff pleasantly deals with the call and by the end of the call, there is some good, sincere rapport going. The information is put on the “Do-Not-Mail” list… but the call ends. This call shouldn’t end the same way as the other “angry” calls. Certainly it wasn’t the same, so why should it have the same result? Turn the friendly (and rational) “Take Me Off Your List” calls into a sales opportunity. Be prepared with a referral incentive – a gift card to a local restaurant, store or gas station works great. Remember this is for a specific type of call so it will be a small investment for your long term success. Make sure your reception staff knows about this! “Thanks again for calling. I really appreciate you and our conversation. Listen, you sound like such a nice person. This is truly a great offer, and we even have a referral bonus program. Can you think of anyone that we might be able to help with a hearing loss? Have your friend or loved one call and make an appointment, when he or she comes in for an appointment – we will send out a gift card as a personal thanks to you. A win/win for everyone! Without any kind of hard sell or creepy factor. Not only can you make your marketing dollars work over-time, you are building your “Likabilty” factor in your community. You are investing in the golden kind of advertising – Word of Mouth. I bet this “Take Me Off Your List” caller will never forget your name next time a friend or loved one has a hearing problem. You have already spent money to get the call in the first place. Instead of completely disregarding these calls as non-opportunities, why not try to make the most of them?